I was sure Friday was going to be a bad day. 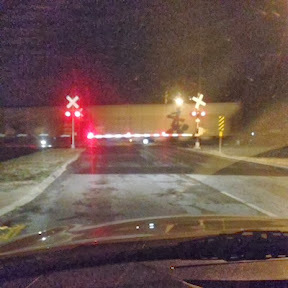 On my way to workout I got caught behind a train, then after arriving to my workout 5 minutes late I saw the workout on the board and kinda freaked out. It was too hard, it was just too much. I didn’t know how in the world I was going to get this workout done. 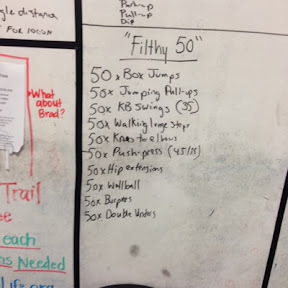 It was called Filthy Fifty and is kind of a Benchmark workout. I don’t know that officially but my class does it a couple of times a year to see progress. I kinda freaked just looking at it. Some I knew I could do some of the exercises with no problem but 50 burpees or 50 Push Presses was just too many. I thought about crying before the workout so you can imagine how excited I was for it to start. We got a 50 minute cap on this workout and I couldn’t imagine doing the burpees in that time frame much less the entire workout. But it began none the less…. And I was able to do it. Against my doubt I was able to finish the workout. Side Note: After the workout was done I finally got to move down a notch on the resistance and did 10 pull ups, all the way ups. So you can imagine how excited I was to get to work. I try not to talk about work to much on here but Ill make an exception this time. When I got to work things started to fall into place. I got my entire daily to do list done my 11am and then things that I have not been able to get started filing in as well. It was shaping up to be an awesome day. I was so excited to be able to mark everything off my “To Do” list and then mark the things off my “Maybe Get Done” list. It was awesome. I finished up my day by marking up my “Never Gonna Get Done” list and just left with a smile on my face. I’m pretty sure my day took a turn for the better by finishing that workout. Ha! Ok, so maybe it didn’t do anything about the rest of my day but the fact that my day took a turn from Eh to GREAT! Is a nice change of pace. Usually it’s the other day around. This workout taught me a lot of things. 1. I can do way more than I think possible. 2. I never need to read the WOD the night before because there is no way I would have come Friday if I had known what was coming. 3. Knees to Elbows are hell on the hands. Once the weekend officially began I ran off to Friday night basketball. Don’t you worry about a break between seasons, not here, we went right from a Championship Football game on Friday night to Regular Season Basketball game the next Friday night. Now my weekend was pretty chill. I chose not to workout on Saturday morning because I really felt like my body needed a day of rest, more than Sunday like it always gets. It made a big difference this morning because my lefts finally felt fresh and not like they had been beat to death like they do the 6 other days of the week. Now this morning’s workout was a little bit different. We did squats for our strength work up to 95% of our max squat weight and I was so happy because my 95% felt so good. I could have done lots more. I cannot wait to re-max on back squats. 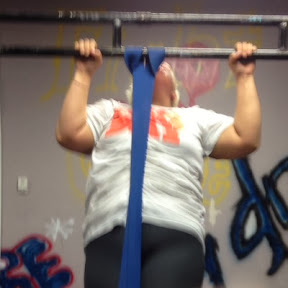 It seemed so easy on the board but it was way tougher than I thought. I got a whopping 3 rounds done the first time, and a whopping 3.5 rounds done the second time. If you are wondering that was not a great number! But I was giving it all I had so I have no regrets. Today Ill go back to vaguely talking about work. It was just another Monday, this one just happens to be a Monday that starts a short week! Yippee!!!! Im really excited about Thanksgiving and Black Friday...beginning to get a little nervous about Thanksgiving because my sisters and I are preparing the meal ourselves this year. Let me just give you all the info, we don't really cook. We can all cook basic things for our family's and for my lunch everyday but no Thanksgiving dinner. And I still have scorched cabinets from the last fire in my kitchen, note, last not only!!!! I cant it on fire on a regular basis now. Im so looking forward to the holiday but should be able to post again before the holiday and especially before Black Friday, you know Black Friday will get its own post!!!!! !